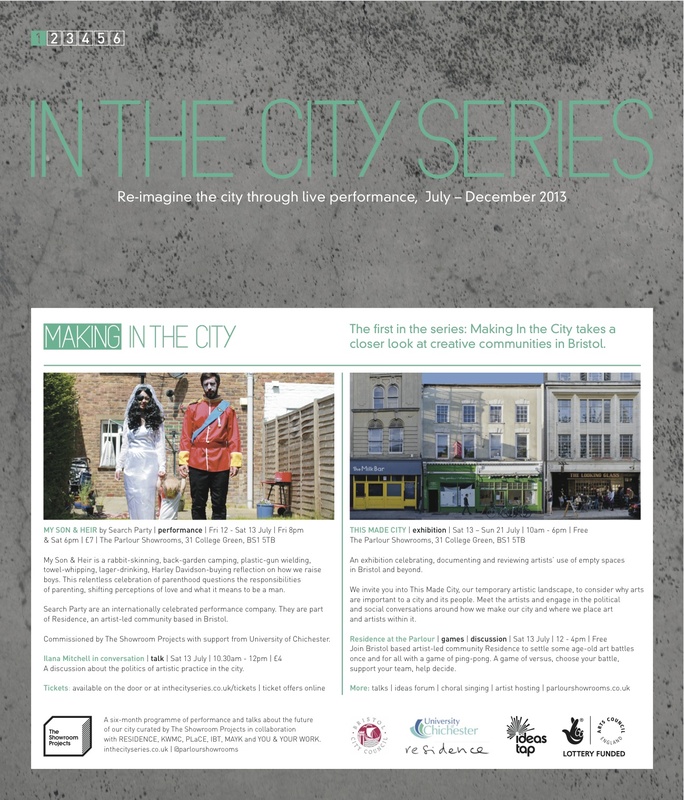 Residence are working with Showroom projects this July to launch their 6 month ‘In the city’ series of performance, talks and exhibitions. Residence have co-produced one day of chat in this opening series ‘Making in the city’ we will be talking about creative communities in Bristol, capacity buildings, how we age in an artist-led model all with ilana Mitchell – and any art dilemma you can think of which needs resolving via a a good old battle of ping pong. The chat is proudly bookended by the presentation of a new Search Party performance MY SON & HEIR. My Son & Heir is a rabbit-skinning, back-garden camping, plastic-gun wielding, towel-whipping, lager-drinking, Harley Davidson-buying reflection on how we raise boys. This relentless celebration of parenthood questions the responsibilities of parenting, shifting perceptions of love and what it means to be a man. Ilana Mitchell in conversation | talk | Sat 13th July | 10.30am-12pm | £4 A discussion about the politics of artistic practice in the city. Join Bristol based artist-led community; Residence to settle some age old art battles once and for all with a game of ping-pong. A game of versus, choose your battle, support your team, help decide.